Assam (ancient pragjyotish) had two important Hindu kingdoms i.e. Kamapura and Ahom. The Ahoms had established their kingdom in the 13th century over the north-eastern part of Assam and ruled for six centuries. The great Ahom ruler Suhungmung (1497-1539) A.D. gave its modern name Assam. At the end of the 13th century Kamarupa became independent. Both kingdoms faced several invasions from Bengal. Hussain Shah of Bengal finally annexed the kingdom of Kamarupa. In the 14th century Bengal became independent from the Turkish rule. Bengali literature flourished during this time. The Bengali version of Ramayana and Mahabharata were also prepared during this time. In Bengal, the Adina mosque and the tomb of Jalal-ud-din Muhammad Shah at Pandua and the Dakhil Darwaza and Tantipura mosque at Gaur were built. The oblong shape of many structures and the peculiar style of roof constructions were some of the distinctive features of the regional architecture of Bengal. In the medieval period Odisha was known as Utkal. It emerged as an independent kingdom under the Ganga and the Gajapati dynasties. They ruled for 500 years. Great temples like those of Bhubaneswar, Konark, and Puri were built during this period. It became a part of the Mughal Empire in the 16th century. In the 14th century, the Shah Mir dynasty was founded in Kashmir by Shah Mir. Zain-ul- Abidin was the famous ruler of Kashmir. The translation of Mahabharata and Kalhana’s Rajatarangini into Persian was done during his reign. He is remembered in Kashmir as Budshah. Timber, stone and brick were used in the Jama Masjid completed by Sultan Zain-ul-Abidin. The turret is a striking feature of the mosques of Kashmir and recalls to mind the Buddhist pagodas. The tomb of Zain-ul-Abidin’s mother, built entirely of brick and glazed tiles, has been designed in the Persian style. The city of Jaunpur was founded by Firoz shah Tughlaq in 1359-1360 A.D. In the 15th century, Malik sarwar founded the Sharqi dynasty of Jaunpur. Muhmud Shah Sharqi, who conquered Delhi for a short time, was the famous ruler of this dynasty. The famous Atala masjid is an example of Sharqi style of Architecture. A huge massive screen covers the dome. The walls and the ceilings are decorated with many ancient Indian designs like the lotus. The city of Ujjain was a famous seat of learning and culture in ancient period. During the 15th century it became independent from Delhi sultanate. Hushang Shah and Mahmud Khalji consolidated Malwa as an independent kingdom. Baz Bahadur was the last independent ruler of Malwa. Malwa was finally conquered by Akbar. Instead of Dhar, Mandu became the capital of the rulers of Malwa. They adorned Mandu with magnificent buildings of which the famous ones are Jami Masjid, Hindola Mahal, and the Jahaz Mahal and a number of tombs. The buildings of Malwa have wide and imposing arches and the windows are gracefully decorated. The tomb of Hoshang Shah is made entirely of Marble, the first of its kind in India. It is delicately decorated with yellow and black marble inlay work. The independent kingdom of Gujarat was founded by Zafar Khan. Ahmad Shah established the city of Ahmedabad and made it the capital of Gujarat. Ahmad Shah built the Tin Darwaza and the Jami Masjid. The finest building in Ahmedabad is the Sadi Saiyyid Mosque popularly known as the Jaliwali Masjid. Mahmud Begarha ruled for 50 years. During his reign the Portuguese established their settlement in Gujarat. Gujarat became famous for its wood carvings, for example Jami Masjid at Champaner and Bibi Achyut Kuki Mosque. Marwar was ruled by the Rathods. They established their rule in the 13th century. Jodha was a famous king of this dynasty founded the city of Jodhpur and made it the capital of Marwar. He also built the famous fort of Mehrangarh at Jodhpur. His son Bika founded the State of Bikaner in the mid-fifteenth century. The Bahmani kingdom was founded by Hassan Gangu in 1347 A.D. with the title of Alauddin hassan Bahman Shah. His capital was at Gulbarga. Sultan Ahmad Shah I transferred the capital from Gulbarga to Bidar in 1424 A.D. Most important period was under Mahmud Gawan (1463-1481 A.D.), the great minister of Bahamani kingdom. There was a struggle between the Bahmani Kingdom and the empire of Vijayanagar over the region between the rivers Krishna and Tungabhadra known as the Raichur doab. In the middle of the 15th century Bahamani was divided into five kingdoms – Bidar, Berar, Ahmadnagar, Bijapur and Golcunda. These kingdoms maintained their independence until they were finally annexed by the Mughal rulers. The Bahmani Sultans in the Deccan erected a number of buildings in a distinctive style at Bidar and Gulbarga. They borrowed from the styles of Persia, Syria, Turkey and those of the temples of southern India. The courtyard of the Jama Masjid at Gulbarga is covered with a large number of domes. It is the only mosque in India which has a covered courtyard. Instead of minarets, there are domes at the four corners and a fifth and bigger one above the prayer chamber. The absence of decorative work does not mar its grandeur.There are two groups of tombs. The first group has the tombs of the first two Sultans and shows the impress of the Tughlaq Architecture. The second group called the halft gumbad or ‘seven tombs’ shows the influence of Persian and ancient Indian styles. Bidar also has a number of tombs. The tomb of Sultan Ahmad Shah Ali is richly decorated with beautiful paintings. The finest monument at Bidar is the madrasa of Mahmud Gavan. It is a three-storied building and has two towering minars at the front corners. After the Bahamani kingdom was spilt up, many other buildings such as the Mehtar Mahal and the Ibrahim Rauza were erected in the new principalities. The Gol Gumbaz at Bijapur and the fort of Golconda and many tombs in Golconda also belong to this period. The Vijayanagara Empire was founded by two brothers in 1336 A.D. They were Harihara and Bukka. Four dynasties ruled in this empire for 400 years. They were Sangama, Saluva, Tuluva, and Aravidu. The Empire of Vijayanagara covered almost the entire region south of river Krishna. Their capital was Vijaya-nagara (modern hampi in Karnataka). Italian Nicolo Conti from Italy, Abdur Razzaq, the Persian Ambassador and Domingo paes from Portugal visited the Vijayanagara kingdom. 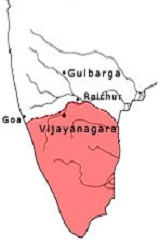 Vijayanagara Empire was divided into provinces called Rajyas and mandalams. The provinces in turn divided into districts called Kottams or Venthe and further sub-divided into nadus. Village or grama was the smallest unit of administration. The village was administered by a body of twelve functionaries, collectively called Ayagars. They were appointed by the king. Gold coins issued by the vijayanagara kings were called varaha. The coins indicate that the religion of most of the kings was Vaishnavism. The society of Vijayanagara was organised on the system of Varna. The king considered it their duty to protect and promote the social order based on Varnashrama system. The merchant classes were divided into Velangais and Idangais. Women occupied honourable positions and were educated. Widows could remarrry. The Vijayanagara rulers patronised Sanskrit, Tamil, Telugu and Kannada languages. Sayana, the great Sanskrit scholar of this period, wrote commentaries on the Vedas. Devaraya I was a great patron of learning. In his court, the famous Telugu poet Srinatha lived who wrote Haravilasam. Devaraya II wrote two works i.e. Mahanataka and Sudhanidhi and a commentary on the Brahma Sutra of Badrayana. Krishnadevaraya was known as Abhinava Bhoja. Eight great telugu poets adorned his court. They were known as Ashta Diggajas. Krishnadevaraya himself wrote Amuktamalyada in Telugu, a treatise on polity and administration. Devaraya I constructed a barrage on the Tungabhadra River and an aqueduct. It was 24 km long and was used for supply of water to the capital. A prominent feature of Vijayanagara architecture was the addition of a large pillared hall, known as Kalyana-mandapa, to the old type of temples. Other features included the towering gateways called gopurams and ornate pillars. The finest temples of Vijayanagara are in Hampi, which has been designated as a world heritage city. The most famous among these temples are the Vaithalaswami temple, Hazar Rama temple and Virupaksha Temples. The Vithala temple has three gopurams and a number of highly decorated pillars. The pillars of the Hazar rama temple were richly carved as were the inner walls and depicted scenes from the Ramayana. The life size portrait statues of the Narasimha and of Krishnadevaraya and his two queens are fine examples of Vijayanagara art. One thing can be noticed during this period that these regional kingdoms, i.e. in North, in Deccan and in south followed social order based on Varnashrama system. Even in Deccan, Bahamani kingdom developed its architectural pattern by borrowing from the styles of Persia, Syria, Turkey and those of the temples of southern India. Thus these regional kingdoms played a significant role in the development of a common culture.